At the end of your stay at St. Barths’ Villa C’Est la Vie, certain memories will stand out; the golden sunsets as they dipped into the Caribbean Sea, late afternoon naps on the outdoor day bed, mid-mornings idly floating in the infinity pool, and the feel of the trade winds as they caressed your sun-soaked skin. Long after your tan has faded, these memories will beckon you back to the island of St. Barths. Located in St. Barths’ chic Point Milou, Villa C’Est la Vie is a brand new two-bedroom luxury villa perched on the hillside. Contemporary and stylish with bright splashes of color, Villa C’Est la Vie is accented in high-end furnishings, adding comfort to the villa’s eclectic flair. The outdoor living area is ideal for long days spent catching the sun’s golden rays as they pass through the trade winds. Enjoy fresh barbecued dinners while taking in the sweeping views of the Caribbean and the surrounding islands, or simply cuddle up on the day bed and enjoy the sunset. Those looking to maintain their fitness routine can take advantage of Villa C’Est la Vie’s fitness center. Among the fitness center’s amenities are an elliptical trainer, Nautilus Freedom cross trainer, Hoist leg equipment, weights and bench; the center also offers a spectacular ocean view to make your work out more enjoyable. Villa C’Est la Vie is only a short drive to some of the Caribbean’s most beautiful beaches, so you can feel the powder-soft white sand beneath your toes whenever the whim strikes you. 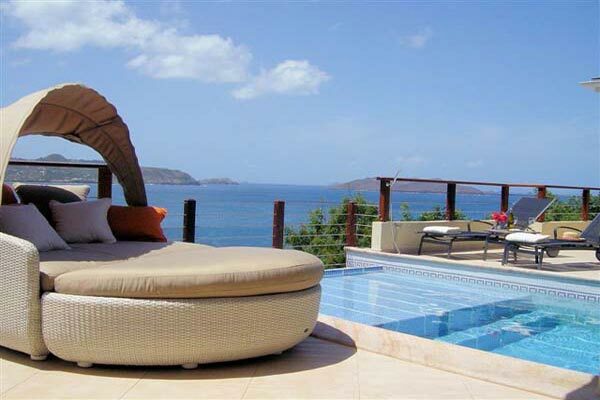 At Villa C’Est la Vie, simply lay back and enjoy the views without a worry in the world.